The OIC Tax Planner is interactive desktop software for the seasoned tax pro, downloaded to your computer, that provides the required forms, help and publications on all IRS collections issues. All bundled together in a fill-in-the-form program that allows you to enter information once and flow to appropriate forms, schedules and overflow sheets generating ready to submit forms. This package includes OIC Tax Planner software and the IRS Manual-Interactive DVD which gives the practitioner access to the same research resources that the IRS agents and officers know, use and ask. The Interactive DVD contains a comprehensive collection of federal tax documents, IRS code, regulations, and more, all searchable by content. Better to know the answers to questions before they are asked! The network edition of OIC Tax Planner is designed for office environments where company files are accessed across a Windows network - regardless of whether those files are worked on by multiple users or a single user. 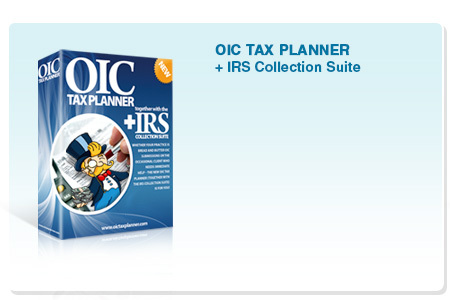 The all new OIC Tax Planner Online is the latest addition to our OIC suite of applications. 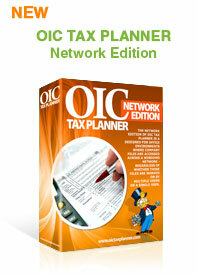 Now the Tax Resolution power of the OIC Tax Planner is available online! The OIC Tax Planner Online is Tax Resolution Software encompassing Offer In Compromise and the entire IRS Collections process. Additionally, you can access your forms and data from anywhere and effortlessly collaborate with your colleagues and clients. Who needs the OIC Tax Planner? Tax professionals: enrolled agents, CPA's and tax attorneys. The OIC Tax Planner is for the seasoned tax pro having an intermediate level of understanding of the intricacies involved in the submission of Form 656 to the IRS. Our software has helped thousands of our clients just like you and help secure that elusive IRS acceptance of an OIC for your client. Form Help buttons are provided throughout, along with automatic computation of the all-important collection standards. Reasonably priced, we invite you to compare us to our competition. What is the OIC Tax Planner? 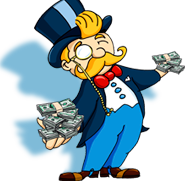 The OIC Tax Planner is Tax Resolution Software encompassing Offer In Compromise and the entire IRS Collections process. The desktop application is interactive desktop software downloaded and stored directly on your computer. The all new Online version is a web application built to mimic our classic desktop application. Both systems provide all the required forms, information and help on all current IRS Offer in Compromise regulations. All bundled together in a fill-in-the-form program that allows you to enter information once and flow to appropriate schedules, forms and overflow sheets generating a ready to submit Form 656. A list of the forms and publications contained in the OIC Tax Planner can be found in our FAQ section. Why do you need the OIC Tax Planner? Because the rules, forms and protocols change from day to day, the OIC Tax Planner support network searches the IRS site to find the latest form updates and alerts you to download them to your system. Additionally, the software, through its exclusive Q-Test module, allows you to run various scenarios to see if your clients will qualify for an offer. Fifteen minutes will save you hours. Where and How does the OIC Tax Planner operate? The OIC Tax Planner desktop application is, upon purchase, immediately downloaded to your computer. You may also install the software on one additional computer, and use this software for as many individual and business clients as you wish, for as long as you wish. The software license never expires but yearly subscriptions are required to keep the software current with updates, form changes and program enhancements. Network versions are also available. The new OIC Tax Planner Online is an online web version of our desktop application. This allows you to securely access your online data from any computer with an internet connection. When does my license for the OIC Tax Planner expire? Your license does not expire, as mentioned above, your use is not limited in any way. However during the renewal period, we ask for your renewal at a substantial discount from your original purchase price. This will allow you to continue receiving updates for the subsequent year. A demo is not available, we believe the only way to experience the power of the OIC Tax Planner is to purchase the full working version, backed with a full 60 day money back guarantee. If you are not satisfied for any reason within that period, simply call or e-mail our support team, and your money will be refunded within 3 business days. The IRS Manual-Interactive DVD gives the practitioner access to the research resources the IRS agents and officers know and use. OIC Tax Planner Online Released! It is our great pleasure to announce the release of the all new OIC Tax Planner Online! Now the Tax Resolution power of the OIC Tax Planner is available online! Check out our new online system today! IRS collection standards - updated March 27, 2018. We continue to work hard to keep the OIC Tax Planner up to date. Forms 433A(OIC), 433B(OIC), updated March, 2018. 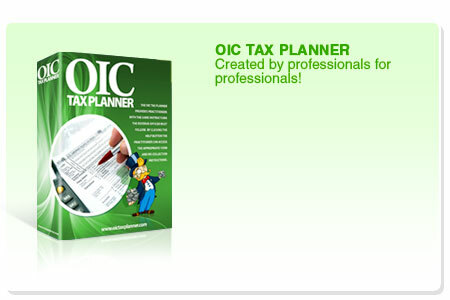 Thank you for choosing OIC Tax Planner! "The software is easy to use and quite comprehensive. Using the software I have successfully submitted more offers this year than in all my previous years of practice. I can't imagine preparing an offer without this software. This program makes my job easier and my practice more profitable." What are you looking for in OIC software?